My most treasured possessions are my daughters. At least I used to have some kind of posession over them, I probably don’t anymore. I was lucky enough to once work for Jimmy Fitzgerald which was time well spent. I was there when Forgive ‘N Forget won the Gold Cup, so I learnt so much, particularly the importance of ‘evening stables’, when you go round all the horses with a fine-tooth comb, checking for any problems and most of all talking to the lads and lasses who work so closely with their charges. I have always wondered what would happen if the world stopped spinning. Would we all fall off? My first thrill of racing was standing at the last fence at the Alnwick point-to-point, and enjoying the exciting spectacle of the horses flying over the fence and the noise of the birch when their legs were brushing through it; it sent my heart racing. It was then I realised that I simply had to do this. By the age of 16 I had my first ride in a race – okay I fell off, but I got straight back on and completed it. The sheer excitement was fantastic and quite unbelievable. I was hooked. My daughter, Amie, has followed a similar course to me, though I have to say she has already ridden far more winners than I did. She spent time working in the yard of champion trainer Paul Nicholls and has brought back many good ideas and tips to Molesden. She does a lot of the early schooling work, teaching the youngsters to jump and race with other horses. My brother Adam took up race riding at the later age of 35, and has done extremely well, riding over 15 winners. I think the relationship between us all has provided a lot of entertainment for others, as there are tremendous ups and downs in racing, but it seems to have worked. My most memorable day was in April when I took seven horses to the Morpeth point-to-point and I came away with three winners and two seconds all ridden by my daughter and brother. We all need days like these as they give you the confidence to feel that you have the ability to produce horses capable of winning. Of course by the end of the night I was the best trainer in the land and we had a great night celebrating with friends. Even strangers became our friends. 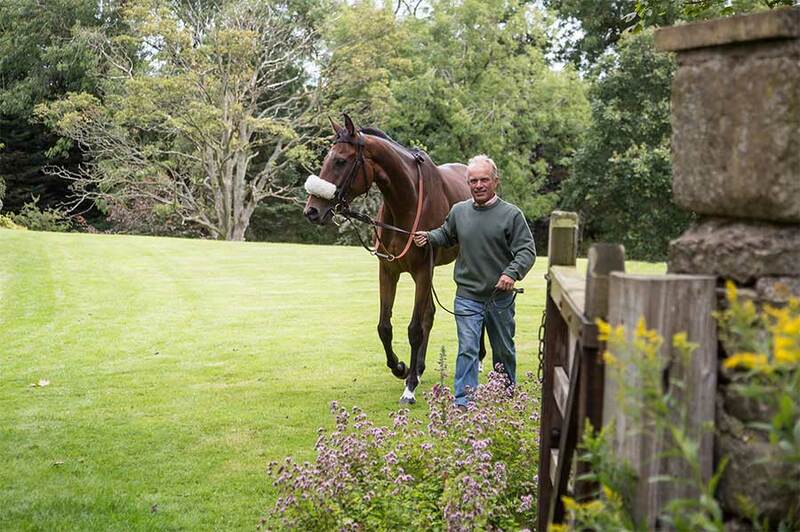 My biggest challenge is always finding new owners, so we thought the best way to progress would be with The Northumberland Racing Club, where people can enjoy race horse ownership relatively cheaply and at a fixed cost. It seems to be working well as everyone is having a great time and we had our first winner in January with a lovely mare called Total Assets, who tries her heart out for us. We are lucky that Grand National winning jockey, Ryan Mania, has remained loyal to us after his incredible win at Aintree. Ryan has been coming to ride out and school horses for a few years and has ridden for our other owners as well as The Northumberland Racing Club. My biggest indulgence is owning too many horses. I’d probably spend my last pay cheque on another horse. My perfect day involves getting up early and having fun with the team we have at Molesden. I love seeing the horses slowly progressing and all looking happy. My philosophy is to take one step every day – if you try and take two that is when things go wrong.